In the marketing industry, wholesalers, distributors and retailers play integral roles in product dissemination. However, despite bearing strong associations, these function differently in the supply chain. This article provides the differences between these three terms. A wholesaler is a merchant or a firm that purchases and stores a large quantity of products from manufacturers and vendors before reselling them to retailers, commercial users and other merchants. A distributor, on the other hand, is an entity that acts as a mediator between a manufacturer and another entity within the supply chain. Meanwhile, a retailer, also called a merchant, is a person or an entity that purchases and sells products directly to end consumers by the use of different types of distribution channels. Despite working closely in the supply chain, there is a major difference between a wholesaler, a distributor and a retailer. Mainly responsible for distributing products to different parties or entities, distributors act as a major link in the supply chain. Wholesalers, on the other hand, purchase a huge quantity of products directly from the distributor. Between the three, retailers are at the lowest point in the supply chain as they typically buy products from wholesalers. Unlike wholesalers and retailers, distributors typically establish a business relationship with the product manufacturer by securing a contract, which states exclusive agreements that can give the distributor the full power to disseminate goods within a specific territory. Some contracts also clearly identify and limit the degree of involvement of every participant involved in the contract. A distribution channel aims to deliver products from manufacturers to end consumers by the use of different intermediaries, also known as mediators or links. 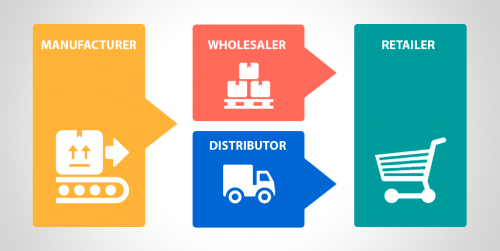 Distributors, wholesalers and retailers act as intermediaries, but they function in the different levels of the distribution channel. A retailer functions in a one level channel, which contains only one intermediary. In this channel, the merchandise is transferred from the manufacturer to the retailer, who sells the product to end consumers. Meanwhile, a wholesaler is present in both two-level and three-level channels. As the name implies, a two-level channel is made up of two intermediaries – the wholesaler and the retailer. The three-level channel, on the other hand, is a channel type where the distributor, the wholesaler and the retailer work together to deliver products to end consumers. Both distributors and wholesalers typically use the “business-to-business” (B2B or B to B) model, which pertains to a type of transaction made between two or more companies. Meanwhile, retailers are “business-to-consumer” (B2C) companies, which simply means that they sell products directly to consumers. As a B2C company, retailers are mainly responsible for selling products to end consumers. Wholesalers, by contrast, may or may not sell products directly to end consumers. Aside from their role in disseminating products, they also need to invest in storage since they buy a lot of products from distributors. In the marketing industry, storing products is more commonly known as warehousing. Between the three, distributors play the most complex role since they need to increase the visibility and sales of the products by running promotional campaigns. Distributors also need to allocate a budget for transporting products to either wholesalers or retailers. Even though they can transfer products to these two intermediaries, they are never allowed to sell products to end consumers.